Tonight Teena and I attended our second Open Roof Festival. It's held under the stars (and moon as you see) at 99 Sudbury Street. Open Roof Festival is a not for profit, outdoor music and film festival providing Toronto with a summer experience like no other, highlighting independent filmmakers and artists from Canada and around the world. The Festival is a fun, unique experience that is more than just a party – its an evening of shared experiences. Of Toronto’s music and film scene. Of refreshments. And, of enjoying Toronto’s beautiful summer nights with friends. Open Roof Festival is an almost entirely volunteer-driven event and all profits raised are put forth in support of Canada’s independent film production and music communities. Amsterdam Brewery was there selling beer and Cool City Oyster Yard was serving clams, oysters and something sweet. Tomi Swick, a 2007 Juno Award Winner for New Artist of the Year, opened the festival with a half hour music set. His website says that Tomi has written a huge cache of emotionally charged rock songs and ballads. His influences run the gamut from James Taylor to Radiohead and Jeff Buckley to the Beatles. The thirteen songs he wrote for his debut, Stalled Out In the Doorway, tell honest tales of some of the harsh realities or relationships. His beautiful and lilting melodies sometimes belying the dark subject matter in many of his songs. I enjoyed his stuff. Afterwards the band packed up and trucked to Hamilton for another gig. 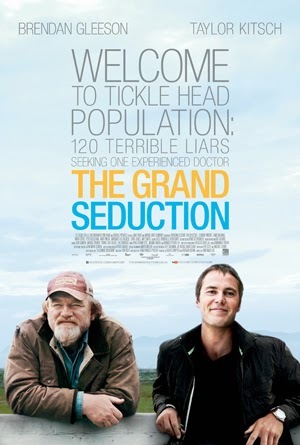 Tonight they were showing The Grand Seduction. The only hope for the tiny outport of Tickle Head is a new Petrochemical plant, but in order to qualify for the bid they need to prove they have a resident doctor. When fate sends Dr. Paul Lewis (Kitsch) their way, unemployed fisherman, Murray French (Gleeson) mobilizes the town to do everything they can to convince the fast living, jazz loving, cricket playing doctor that their sleepy harbour is a paradise tailor-made just for him. From the previews, I went in expecting a quaint little movie. What I got was a really funny but heartwarming movie. Great script, great acting and shot in such a beautiful location (Trinity Bay, Newfoundland and Labrador). If you think of some of the charming and funny movies like Waking Ned Devine, The Full Monty or Cold Turkey, this is every bit as good and perhaps better. Set in Newfoundland, it would be an enjoyable movie to watch no matter where you are from. An 8/10!